Tie your apron on this week and bake up a batch of the sweetest, fluffiest zucchini muffins around! They're perfect for snacking or alongside my Raw Sweet Corn and Cherry Tomato Salad for a light Fourth of July dinner outside before the fireworks begin. Try shopping at your neighborhood health-food store co-op or farmers' market for your produce this week to ensure the freshest veggies around; I promise they will taste better! Fresh ingredients set the stage for delicious flavors to shine through, and I promise you won't be disappointed (or weighed down!) by the recipes this week. 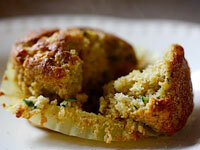 These tender, sweet muffins are the perfect way to use up all that summer zucchini! 1. Preheat oven to 375. In large bowl, whisk together flour, sugars, salt, baking powder, cinnamon, and nutmeg. Set aside. 2. In medium bowl, combine grated zucchini, eggs, vanilla, and oil. Stir well to combine, then gently stir into flour mixture. Be careful not to overwork this—it will lead to dense muffins! 3. Fill lined muffin tins about 3/4 of the way up with the batter and then sprinkle cinnamon and sugar on each. Bake for about 30 minutes or until golden. Perfect for summer pasta dishes and yummy sandwich spreads! 1. Blend basil, parsley, garlic, miso, and bread crumbs in food processor or high-speed blender until smooth. Slowly drizzle in water while machine is running to reach desired consistency. 2. 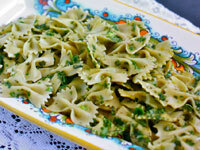 Spread pesto on sandwiches or use as pasta sauce. Freeze individual portions in little snack-size sandwich bags for later! My new favorite salad this summer! 1. Holding an ear of corn in one hand, carefully run a knife down the side of the cob with your other hand to remove the kernels. Go slow—this can get messy with flying corn kernels everywhere. It’s worth it, though! 2. 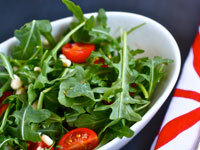 Place arugula in large bowl and toss with corn and cherry tomatoes. 3. In measuring cup, combine all dressing ingredients and whisk well. Pour over salad and toss gently.